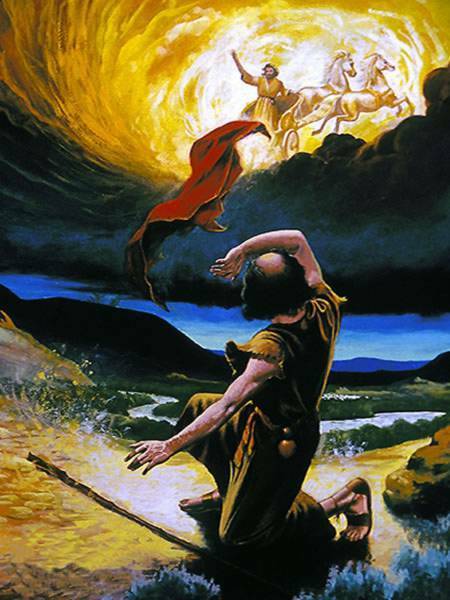 The above picture show Elijah passing his mantle to Elisha. 1 Kings 19:19 says. So Elisha picked up Elijah’s glory. He picked up where Elijah left off. It’s a beautiful picture of the Scripture in Hebrews above. I also love the picture of Elisha taking that mantle and trying it out. He struck the waters and beseeched the Throne of God and asked where God was…and God showed up and the waters parted! There is yet and I believe now is, a generation with the anointing, mantle, spirit, and power of Elijah to prepare the way for Christ’s second coming. I know Elijah was a man just like us (James 5:17). Jesus was a Man too. He is also the Son of God as Adam was also (Luke 3:38). The anointing is the same but different. We have an anointing from the Holy One. We receive it from Him because He decides what type of anointing. Remember what Elijah said to Elisha when Elisha asked for the double portion? Elijah said, “You have asked a hard thing. Nevertheless, if you see me when I am taken from you, it shall be so for you; but if not, it shall not be so.” The ball was in God’s court in regards to that double portion. Now is there a difference between the mantle or the double portion. The mantle was passed on but the double portion was subject to Elisha prophetic experience. Hearts of the fathers to the sons could also speak of past and current/new generations coming to together and, if I may borrow the term Dutch Sheets used, the synergy of the ages. Standing in agreement with previous prayers and adding on so that bowl of incense may be poured upon earth for perfection. I went on a little bit of a rabbit trail but I think I clarified. I know some will still disagree but it’s all good! I love you guys who read and comment and like my blogs! We are in this together, Amen!? We need unity amongst diversity for there are many gifts but One Spirit! I find your premise interesting and quite frankly I had never thought of the passing of annointings and mantles but certainly you did establish precedent. I will because of your insight investigate this further. Thank You for the share. I was excited to read your post. What you talked about is hinted at when we talk about people becoming like the people they call friends. Anointings are like ingredients, when you hang around other people, you pick up their “flavor.” Although your flavor is uniquely yours, like each tomato tastes different, anointing groups can be very similar. Understanding how anointings are mixed becomes very important when you choose the people with whom you share yourself. It colors being “unequally yoked” in a whole new shade. There’s a lot to explore here and I would love to hear you talk about this in more depth.